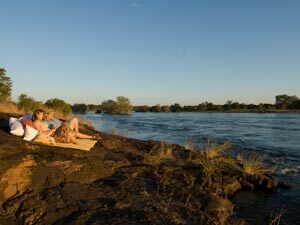 Zambia, with its endless source of adventure opportunities, is a carefully guarded secret by safari aficionados. 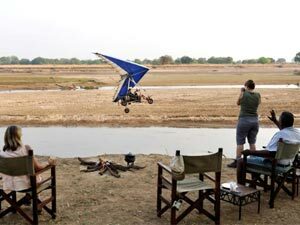 A trip to Zambia is a journey into the very heart of the African continent where, largely inaccessible and fiercely protected it offers the traveller an intact natural beauty. In addition to the magnificent Victoria Falls, Zambia has some of the largest game reserves in the world and is considered the Mecca of walking safaris. Still very wild and off the trodden tourist path, it’s a paradise for nature lovers and safari enthusiasts alike. The 70 tribes that make up the people of Zambia also offer an incredible cultural diversity with their fascinating traditions. Did you say “romantic”? Just imagine…. your table’s set up on a floating pontoon in the middle of the Zambezi River, illuminated by the Milky Way and dozens of oil lamps – Champagne and other delicacies are rowed over by canoe and served to you by your discreet butler… but that’s not all. You’ll be sleeping on a secret island in your very own sophisticated Robinson Crusoe suite. At sunrise, when the sounds of nocturnal animals fade, the chances are that you’ll be sharing your breakfast with a couple of monkeys! In 1855, the great explorer David Livingstone was the first white man to set eyes on the falls from this island. Today, visitors also have the opportunity to admire the stunning view from exactly the same spot. For the more adventurous, you can peer over the ravine to see the bubbling waters over 100 metres down below or dare to swim in one of the “rock pools” only a few centimetres from the edge. Zambia, the quintessence of walking safaris, sends you back to basics to soak up nature and explore off the beaten tracks… to rediscover oneself in its simplicity and authenticity. 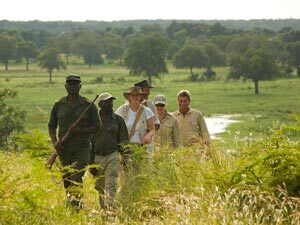 Accompanied by a professional armed guide you listen, track and observe the flora and fauna, learning the secrets of the bush as you go along. At the end of the day, you’ll relive those unforgettable moments with your fellow travellers around the campfire. In the light of the days’ first sunrays you’ll take off to fly over sublime landscapes scattered with animals, rivers and waterfalls. Crocodiles and hippos sleeping on the sandbanks, surprised by the sound of the small engine, run to the river for safety whilst birds fly up and away into the dawn. You are truly at one with Mother Nature. 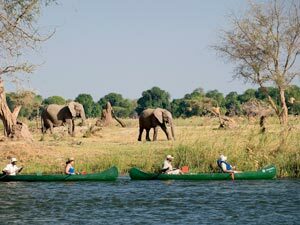 Robust canoes are led by professional guides as the adventure leads you slowly down the Zambezi River in the footsteps of the great explorer, David Livingstone. Paddling along silently you’ll easily observe an array of wildlife going about their business, unperturbed by the discrete passage of the canoes. The river is home to crocodiles and an extraordinary density of hippos, whilst elephants, antelopes and buffalos are frequently seen on the banks. As the day nears its’ end you’ll pull the canoes up onto the sandy shores where your tents are already set up and the campfire lit. 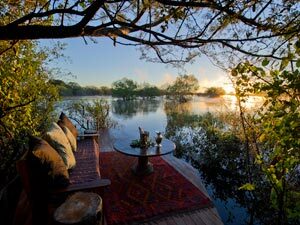 This is the magic “sundowner» moment as you watch the round scarlet sun dip into the majestic river.